A retroviral Gag protein interacts with a cellular protein involved in forming endocytic vesicles in a manner that affects the production of virus particles. These findings help define the suite of host-cell components that are usurped by the virus to help it propagate. Viruses are champions when it comes to commandeering the normal biological processes of their hosts. In the case of viruses with small genomes, such as the retroviral human immunodeficiency virus (HIV) and influenza, the limited coding capacity of the viral genome forces the virus to use many host cell factors to extend its capabilities during entry into, replication within, and budding from the cells of its host. There is currently a lot of interest in understanding how retroviruses interact with their hosts. Work in this area not only helps us understand how viruses replicate, but also sheds light on normal cellular processes. A great deal of attention has been given to how viruses latch onto cell-surface receptors and hijack other components to enter and replicate in the host cells, but much less is known about how they usurp the cellular machinery to orchestrate their exodus. Recently, a new model of virus budding has come onto the scene. It posits that enveloped RNA viruses bud by appropriating the endocytic cellular machinery that is normally used to create vesicles inside the cell: the formation of vesicles and the budding of a virus are topologically the same process, but the reverse of each other. This model has many implications for cell biology and viral pathogenesis, and virologists are now busy uncovering how viruses use the machinery of endocytosis to their benefit. In this issue of Journal of Biology , Margaret Wang, Wankee Kim, Pietro DeCamilli, Stephen Goff and colleagues bring us a step closer by describing the identification of a new endocytic protein involved in the production of a retrovirus, the Moloney murine leukemia virus (Mo-MuLV). The authors characterize the association of a protein involved in the formation of endocytic vesicles, endophilin 2, with the Mo-MuLV protein Gag, and a possible role for this interaction in the production of virus particles. The study identifies a potentially significant new player in retrovirus release and opens up a new line of investigation aimed at understanding the interplay between endocytosis and the cellular release of retroviral particles (see 'The bottom line' box for a summary of their work). All retroviruses have three key genes, encoding proteins called Gag, Env and Pol. Gag is the structural protein that makes up the viral core and drives viral assembly and release. Gag is a polyprotein and is organized into four distinct regions: the matrix (MA) domain, which is closely associated with the plasma membrane and implicated in budding functions; the capsid (CA), which condenses to form ordered core particles that make up the internal shell of the virus; the nucleocapsid (NC), an RNA-binding protein; and a cleavage product whose name, as well as function, varies depending on the virus (for example, for HIV it is called p6 and for Mo-MuLV it is p12). Late in the infection cycle of Mo-MuLV (see the 'Background' box), the viral Gag polyprotein captures the RNA genome, binds to the plasma membrane and assembles into spherical enveloped particles that bud from the cell. Gag is known as the particle-making machine because it can assemble and bud in the absence of other viral proteins. Hence, any additional machinery necessary for viral budding and membrane fission must be supplied by the cell and recruited by Gag. To identify further which cellular factors are recruited by Mo-MuLV during the production and budding of virus particles, Wang et al. used a yeast two-hybrid assay of a mouse T-lymphoma cDNA library using Gag as bait and identified endophilin 2 as a Gag-binding partner. A second yeast two-hybrid screen showed that endophilin 2 interacts specifically with the MA portion of Gag. In vitro binding assays further confirmed the endophilin-Gag association. Members of the endophilin family of proteins are involved in endocytic vesicle formation. Endophilin 2 is one of three members of the subgroup endophilin A and is a regulatory component of the machinery involved in clathrin-mediated endocytosis. These proteins are known to promote membrane curvature and bending and are involved in the vesicular trafficking events of endocytosis . Wesley Sundquist, in the Department of Biochemistry at the University of Utah in Salt Lake City, USA, agrees and is quite excited about Goff's discovery. "This is of particular interest because it indicates that proteins that normally function primarily in the process of endocytosis or endosomal trafficking also participate in Mo-MuLV replication," he says. Next, Wang et al. set out to determine whether endophilins were incorporated into virus particles. They did experiments in which viral particles from cell lysates were harvested using a sucrose density gradient and proteins in these virions were detected and analyzed by western (immuno-) blotting. They found that both endogenous and exogenous endophilin 2 (tagged with the influenza hemagglutinin, HA) is packaged into Mo-MuLV particles. Additional tests confirmed that endophilin 2 was indeed present inside the virion and not simply a contaminant in the purified virions or attached on the outer surface of the particle. To ensure that endophilin 2 is not merely incorporated into virion particles because of its proximity to the plasma membrane, a clever experiment was carried out whereby western blots were probed with antibodies specific for various other endocytic proteins. The virologists found that along with endophilin 2, Mo-MuLV particles contained the prevalent cellular proteins α-actin and clathrin, but not dynamin 2, the major endocytic partner of endophilin. Hence, it appears that the association of endophilin 2 with Gag is deliberate and is likely to play a specific role in virion production. The question of whether endophilin 2 is actually required for virion production remains somewhat hazy. Wang et al. thought that 'knocking down' endophilin 2 levels with a small interfering RNA (siRNA) might cause virus production to go down. Despite reducing the levels of endophilin 2 by up to 50%, they saw no effect on virion numbers - but the method could not fully eliminate endophilin 2, so the residual protein might have been sufficient for function. In a second attempt at eliminating the wild-type function of endophilin 2, dominant-negative effectors (produced by overexpressing wild-type or fragmented endophilin 2) were used to block the protein's function, and this did significantly reduce virion production, although it was not eliminated entirely. These experiments provide evidence that the Gag-endophilin 2 interaction is of functional importance, since viral particle production was inhibited, says Sundquist. "But there is the outstanding question that is raised but not answered by Goff's work which is why the virus interacts with endophilins. So, we now need to understand why this interaction takes place, and such experiments can be very challenging," he says. Heinrich Göttlinger, in the Department of Cancer, Immunology and AIDS at the Dana-Farber Cancer Institute in Boston, USA, adds that "although the work is suggestive, Wang et al. have not yet formally demonstrated that endophilins are indeed required for efficient virus release. Future siRNA knock-downs targeting all the endophilins simultaneously should definitively resolve this issue." But Goff says that such an experiment is nearly impossible since it would almost certainly be detrimental to the cells' survival. Despite the negative results with the knockdown experiment, Goff is not discouraged. "This [negative result] is probably due to redundancy, where other members of the endophilin family compensate for the loss of endophilin 2 expression, or because the remaining levels of endophilin 2 inside the cells are abundant enough to carry out their function." Indeed, the levels of endophilin 2 needed are likely to be very low, as only a minute amount of the intracellular protein is incorporated into virions . "It would also be interesting to know whether the reduced levels of virus production induced by endophilin overexpression are due to a block in virus release or whether the effect might be elicited earlier in the virus assembly/release pathway," says Eric Freed, Chief of the Virus-Cell Interaction Section at the National Cancer Institute in Frederick, USA. Interestingly, Wang et al. found that the Gag-endophilin association was not conserved among other retroviruses. Using the yeast two-hybrid assay, they tested Gag proteins from HIV, Rous sarcoma virus (RSV), Mason-Pfizer monkey virus (MPMV) and simian immunodeficiency virus (SIV). Endophilin 2 interacted with Gag from RSV, which is closely related to Mo-MuLV, but not with any of the other Gags from more distantly related viruses. According to Goff, endophilin could nevertheless be involved in HIV production, although indirectly. The alternative is that some other protein performs the equivalent function for HIV. "This is entirely possible. But we do not know what that protein or proteins might be," he adds. Although it is not yet fully clear how endophilin 2 helps the virus function, the authors do speculate that perhaps endophilin, which normally helps to generate membrane curvature, could be helping the virus to distort the membrane during the process of virion budding. 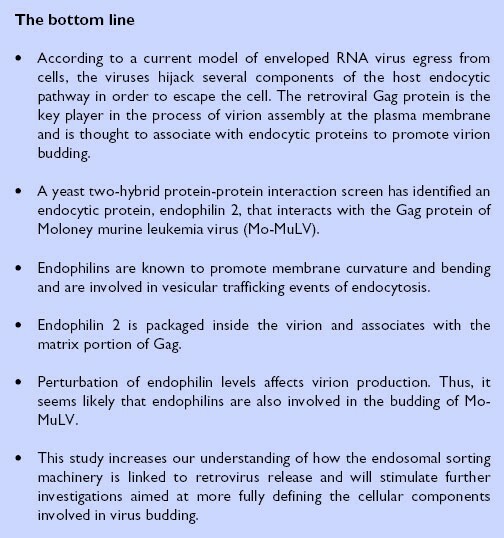 It might also be that the endocytic proteins play an important role in Gag localization and trafficking, as there are now several indications that viral Gag proteins are trafficked via endosomal pathways . Despite the need for more work to clarify some details, Goff's findings do fit nicely with the general idea that is developing in the field that retroviruses make extensive use of the endosomal machinery to bud from cells [4–6]. For example, the very late stages of HIV-1 release appear to be primarily promoted by a direct interaction between the p6 domain of its Gag and the cellular protein Tsg101, which then connects Gag with the endosomal sorting machinery that is involved in inward budding of vesicles into the multivesicular body (reviewed in ). What's more, many other proteins that are part of endocytic complexes, such as Vps28, Hrs, AIP-1, Vps4, and a group of proteins called CHMPs, have been shown to associate with Gag via small motifs called L domains, and are required for various very late steps in virion budding and release . Others have recently shown that infectious HIV particles can bud internally into late endosomal compartments in macrophages , and that MuLV RNAs (and apparently also Gag proteins) are transported to the cell membrane by endosomal vesicles . "I think that there is a general feeling in the field that all of these observations will ultimately be unified to explain how retroviruses are trafficked along the endosomal system and ultimately released from cells," says Sundquist. "Another important aspect of Goff's work is that although it has been clear that retroviruses utilize cellular proteins that function late in the endosomal pathway (for example, Tsg101, AIP1, and Vps4), it has been much less clear that they utilize proteins that function earlier in endocytosis, such as endophilin 2 and clathrin," he adds. This new model of virus budding has many implications for both viral pathogenesis and cell biology. Virus budding is an attractive new drug target, because the pathway appears to be essential and common to many viruses - although common targets can also have potential problems arising from their generality. Cellular targets might also be less susceptible to drug resistance than is the case for many conventional viral targets. "It may be possible to inhibit retrovirus release by targeting the lipid-modifying activity of endophilins with small molecule inhibitors," suggests Göttlinger. Apart from helping design new antiviral drugs, these studies on viral budding will certainly extend our understanding of the endosomal sorting machinery. In many cases, viruses have helped in the discovery of fundamental aspects of cellular biology and facilitated their analysis. 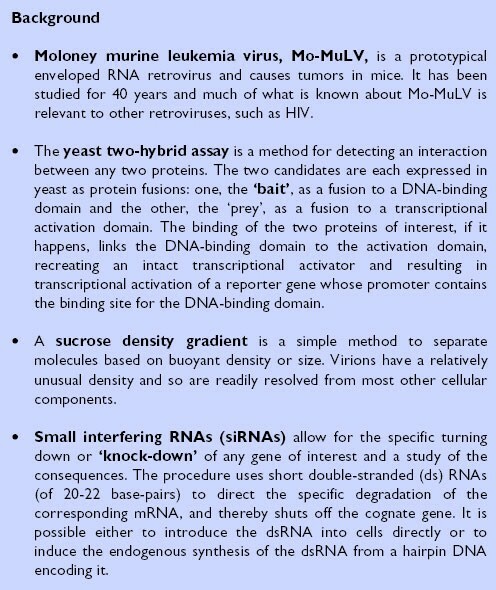 For instance, oncogenes were first identified as host sequences acquired by transforming retroviruses; reverse transcriptase was first identified as a viral enzyme; regulation of translation was first seen in the interferon response to virus infection; and such processes as inhibition of translation and use of internal ribosome entry sites were first studied with poliovirus. Learning how Mo-MuLV and other retroviruses use the endocytic pathway is sure to lead to more new and exciting discoveries for cell biologists.